I took my family to see Disney’s new film, Ralph Breaks the Internet. It is full of fun, laughs and clever Easter eggs. Thank you to Disney for inviting my family to an early screening. A couple of days ago, I was able to take my family to the press screening of Ralph Breaks the Internet. 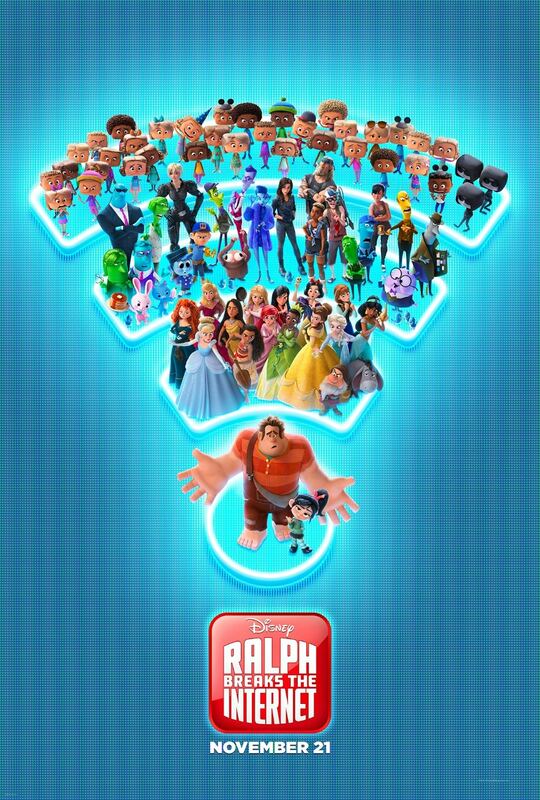 We were all pretty excited to see what our favorite video game characters, Ralph (voiced by John C. Reilly) and Vanellope (voiced by Sarah Silverman) were up to. It’s been six years since we last saw our pixelated protagonists and life seems to be pretty breezy for them. They are now best of friends who would do anything for each other. They have settled into a pretty easy routine and Ralph seems more than content with the lot they have drawn. When Vanellope starts to get a little anxious for some new variety in her life, Ralph takes it upon himself to surprise her. Unfortunately, Ralph accidentally puts Vanellope and her game in danger of the ultimate doom: being unplugged! Meanwhile, something mysterious called “the Internet” has been introduced in the arcade and it isn’t long until the two friends figure out that the solution to their problem lies there. The two jump headfirst (literally) online and into the land of the internet to begin their quest to save the day. Ralph Breaks the Internet succeeds by giving the audience things we are all familiar with and making fun of them. Having most of the movie take place in an imaginary online world gave directors Phil Johnston and Rich Moore plenty of fun things to poke fun at. They do a fantastic job explaining what happens to us when we “go online” in strictly visual terms. We see all the major landmarks everyone sees when on the internet: Amazon, Pinterest, annoying ads, etc. My children laughed several times in the film, but honestly, not as much as in other animated features we have seen lately. The “internet-based” humor sometimes landed a little more firmly on adult ears. There were a couple of scary scenes that my kids had a bit of problem with. One example is a “creepy clown” that made a couple of cameos. His appearance was designed to be funny, by my son is terrified of clowns. As for the other scary scene, I don’t want to give too much of the plot away except to say that the “main bad guy” at the end was simply pretty creepy. Even I was a little spooked out by his appearance. But, on the whole, everyone really enjoyed Ralph Breaks the Internet. John C. Reilly does a great job making his character accessible and relatable. And Sarah Silverman simply has a great cartoon voice that is perfect for Vanellope. The rest of this talented cast is rounded out by Gal Gadot, Taraji P. Henson, Jack McBrayer, Jane Lynch, and Alfred Molina. It also didn’t hurt that Disney simply owns so much intellectual property. The most talked about sequence of the film is when Vanellope stumbles into the Oh My Disney land. This whole part of the film seemed like Disney was simply playing Show and Tell with all the cool things they can put in their movies. It was, by far, the best part of the movie. I think it would be a great idea to make a whole movie with a mash-up of all of these characters. The plot lines and opportunities for jokes would be endless. What would a conversation with Yoda and Dopey be like? Hilarious, that’s what! But the real jewel of “Oh My Disney” was when Vanellope (a princess in her own right) meets up with all the Disney princesses. It was great to see all of these princesses interact with each other and (literally) let their hair down. While I was surprised that Disney let their cherished princesses be seen in such an informal light, I applaud the decision. It made for a lot of great laughs and, as we got the watch the princesses reinvent themselves, it felt right in the midst of the current “Me Too” movement. Check out my behind the scenes coverage of the making of this scene when I was a part of the Ralph Breaks the Internet Press day a few months ago. I would definitely recommend seeing Ralph Breaks the Internet this Holiday season in the theaters. It would make a perfect movie to see on the weekend after Thanksgiving.